Looking for more alternatives to National Parks caught in the government shutdown? Tennessee has no shortage of things to see and do. Here are some ideas to get you started. More are on our first blog post about alternatives. These might be worth adding to your list of things to see when the parks reopen. I cannot find out conclusively if the parkway is open or closed. My suspicion is that it will be open but that National Park Services will probably be closed. There are many communities and towns along the route that rely on tourism dollars. Contact information for the parkway is through the link above. Frozen Head State Park should be at the top of your list of alternatives for the National Parks caught in the government shutdown. It has hiking opportunities, stunning views from the observation deck and a lot more. Tennessee Vacation lists other area attractions. Find out about them here. Bonny Oaks Dr and Lee Hwy. The trail follows the route taken in 1780 by Revolutionary War patriots. The militia was en route to Kings Mountain. Like the Natchez Trace listed above, I am unable to confirm or deny if the park is open or closed. No one is answering at the number provided on the website at the link above. Some of the attractions of Lookout Mountain include Rock City and Ruby Falls. 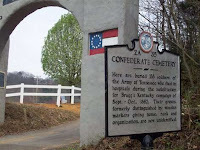 There is a confederate museum and other places to visit on the mountain. Chattanooga.com has the details. The link to our third article on National Park alternatives is found here.